Background: Acetylcholinesterase is a serine hydrolase that terminates the action of the neurotransmitter acetylcholine by hydrolyzing it into acetic acid and choline. Objective: The enzyme, containing an ellipsoidal structure, possesses three binding sites such as active site (with catalytic anionic and esteratic subsites), aromatic gorge and peripheral anionic site, where the inhibiting compounds interact. The acetylcholinesterase inhibitors bind to the enzyme and interfere with the breakdown of acetylcholine, leading to the deposition of acetylcholine in the nerve synapses and causing disrupted neurotransmission. Based on this principle of action, many therapeutic drugs for the treatment of different diseases, pesticides and chemical warfare agents have been synthesized targeting the actylcholinesterase. Conclusion: The present review summarizes the current knowledge about acetylcholinesterase, its structure, function and biosynthesis, its inhibitors, and mode of action of inhibitors on it. Besides, the review also presents an overview about the resistance mechanism that the organisms develop due to the over-application of acetylcholinesterase inhibitors. Keywords: Acetylcholine, acetylcholinesterase, neurotransmission, active sites, acetylcholinesterase inhibitors, insecticide resistance. Keywords:Acetylcholine, acetylcholinesterase, neurotransmission, active sites, acetylcholinesterase inhibitors, insecticide resistance. 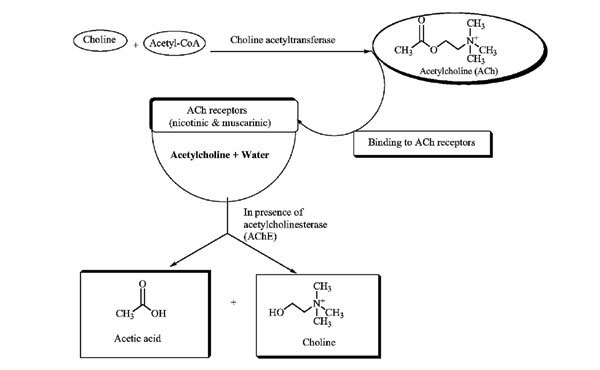 Abstract:Background: Acetylcholinesterase is a serine hydrolase that terminates the action of the neurotransmitter acetylcholine by hydrolyzing it into acetic acid and choline.